Gavin Giovannoni, MD, and MS specialist, is a favorite doctor of mine, even though he can’t treat me as a patient. He resides in England and treats people there and works extensively in the research field of multiple sclerosis and patient centered research and treatment. If there were someone to clone and bring here to the United States for MS work and patient care, my choice would be Dr. Giovannoni. At times when I read his Barts MS Blog, “A Blog for People Affected by MS Interpreting Good, Bad and Other Research News”, I picture him as the Spaniard Don Quixote, battling the windmills. He is outspoken and doesn’t hesitate to challenge that the way we are treating MS is not good enough and doesn’t shy away from any argument on the behalf of people with MS.
Dr. Giovannoni was one of the key speakers at the Annual Consortium of MS Centers 2016 meeting and among his topics was a presentation of the work he is doing on the Brain Health initiative. This initiative is sponsored by a number of organizations and commercial interests and is comprised of a panel of international MS experts. He opened his talk by throwing down the challenge to the people in the room that we need to be doing better in thinking about MS and perhaps follow the model designed in the treatment of Rheumatoid Arthritis (RA). He points out that even though there is still no known cure for RA, the disfigurement that used to come with this chronic disease has been reduced by a significant number, including the need for joint replacement is down by 85%. He says we should be aggressively treating brain health in MS in the same manner – while the search for a cure continues there is research evidence that is clear on ways to keep the brain healthy and protected. His work supports the idea that even though we may think the disease has been slowed by the evidence we see, underneath that there is still activity going on that is not easily visible. To this end, Dr. Giovannoni continues to promote that MS should be treated early and as aggressively as possible and in ways that are acceptable to the person with the disease. He is also adamant that patients must be involved in their own treatment because ‘engaged patients do better,” and clearly says doctors must involve their patients with better communication and shared decision making. He also notes that doctors must encourage and allow patients to manage their own MS and they should function as consultants. Dr. Giovannoni has been part of a task force working on the brain health initiative since its inception and he shared his perspective that the window of opportunity to treat multiple sclerosis and halt damage to the brain may be small, such as what is seen when treating a person for a stroke. It is important to proactively work to stop the disease as soon as possible. He states clearly that there should be zero-tolerance to any indications of activity of MS in people already diagnosed, and suggests that newer ways to measure activity that would otherwise go unnoticed include analysis of monofilaments in the cerebral spinal fluid (CSF) gathered via lumbar punctures and optical coherence tomography (OCT). These tests are not commonly used in the current standards of following disease progression but are often used in the process of the initial diagnosis. Dr. Giovannoni pointed out that not only MS treatments, but other factors impact brain health. Those factors include smoking, exercise, diet, hormones and menopause, sleep, infections and comorbidities – all of which the person with MS may be able to control or at least keep in balance with the proper medical care. Awareness, early diagnosis, immediate aggressive intervention and regular monitoring are the cornerstones of the BrainHealth discussion. The report on Brain Health also discusses the disparities in access to care that happens around the world and even within the United States, a topic that is so large I will save for a separate article. 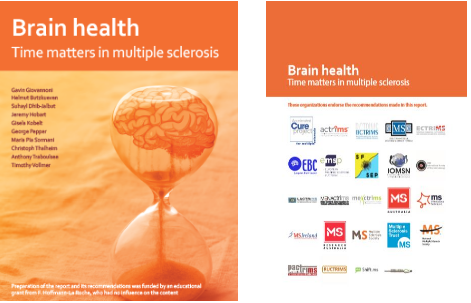 Brain Health: Time Matters in Multiple Sclerosis, was compiled by the international experts with the support of many advocacy organizations and is available to read online. Dr. Giovannoni challenged the audience, particularly the treating neurologists, to agree to join this effort and become ‘early adopters’ and help gather the evidence needed to support the effective treatments needed to preserve brain health in people affected by MS. Maintaining our brain health is a conversation we will want to have with our neurologist and make sure that all is being done to preserve what we have, because what is lost cannot be regained when it comes to axons and neurons.